What is good humanitarian donorship? The Principles and Good Practice of Humanitarian Donorship (GHD) are a set of 23 principles that were established by the world’s main donor governments in 2003, and subsequently adopted by the Development Assistance Committee of the Organisation for Economic Cooperation and Development (OECD/DAC) in 2005. The GHD principles outline a series of principles and practices for donor governments aimed at improving the quality and effectiveness of their humanitarian assistance, and reinforced the idea that donor governments have a responsibility to ensure their aid facilitates more effective humanitarian action. The adoption of the GHD by donor governments was a major step forward in promoting greater transparency, accountability and improved coordination amongst donors. However, donor governments have had difficulty reflecting the GHD principles in their policies and practices, as evidenced by many evaluations, such as the major evaluation of the Indian Ocean Tsunami. Moreover, the GHD lacks specific targets and benchmarks which make it difficult to determine the progress in implementation at the global level and at the level of individual donor governments. For more information on the origins of the GHD initiative, please see Johan Scharr’s chapter from the HRI 2007, The Birth of Good Humanitarian Donorship, available here. 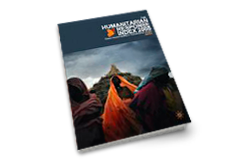 Created in 2007, the Humanitarian Response Index (HRI) has been the world’s only independent tool for measuring the individual performance and commitment of government donors against Good Humanitarian Donorship Principles. The HRI aimed to identify and promote good donor practice and contribute to greater transparency, accountability and impact in humanitarian action. By providing an independent assessment and empirical evidence on how individual donor governments performed compared to their peers, the HRI helped the civil society and policy makers rank and benchmark the quality of government humanitarian assistance and contributed to efforts to improve the effectiveness, and impact of relief and recovery efforts. The HRI was not an index on the volume or quantity of funding provided by Western governments for humanitarian assistance. It looked beyond funding to assess critical issues around the quality and effectiveness of aid. The HRI complemented other monitoring tools and assessments that are used by the humanitarian community but was an independent exercise that was not funded by any government. The HRI has been a collaborative effort supported by many of the world’s largest humanitarian organizations (such as UN OCHA, IFRC and UNHCR) and academic institutions (such as the University of Bochum, Columbia University, etc. ), and endorsed by leading figures such as Kofi Annan, Jeffrey Sachs and Simon Maxwell. The need and importance of the HRI for the humanitarian community has been recognized by many organisations, including at the World Humanitarian Summit in Istanbul. We are currently mobilising resources for an improved version of the project, since we believe it had a positive effect in terms of changing donor policy and practice and increasing accountability towards crisis-affected populations.